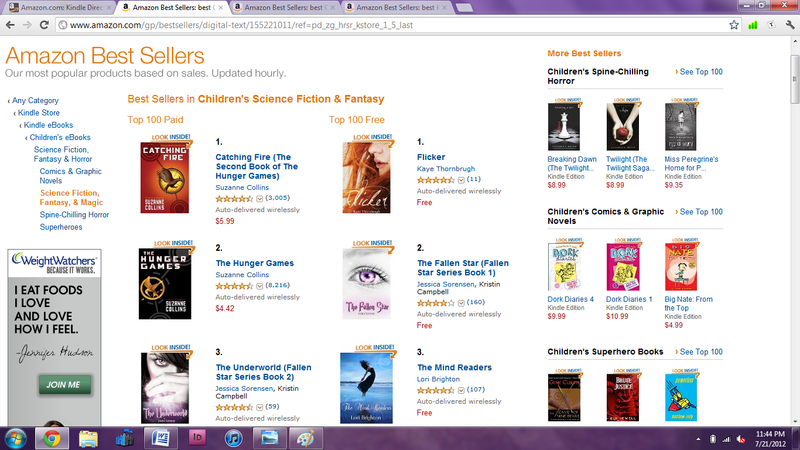 Between 6:40 p.m. and 12:00 p.m. last night, Flickerwas #1 in sci-fi/fantasy in the free Kindle store! I am astounded. 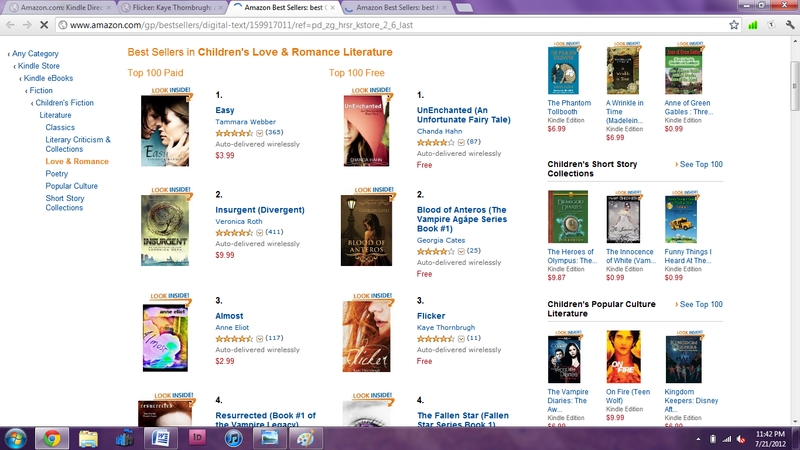 I never thought I’d see the cover of my book in a #1 slot (not even in the “free” category), right next to Catching Fire and The Hunger Games. I’m still wigging out over here! 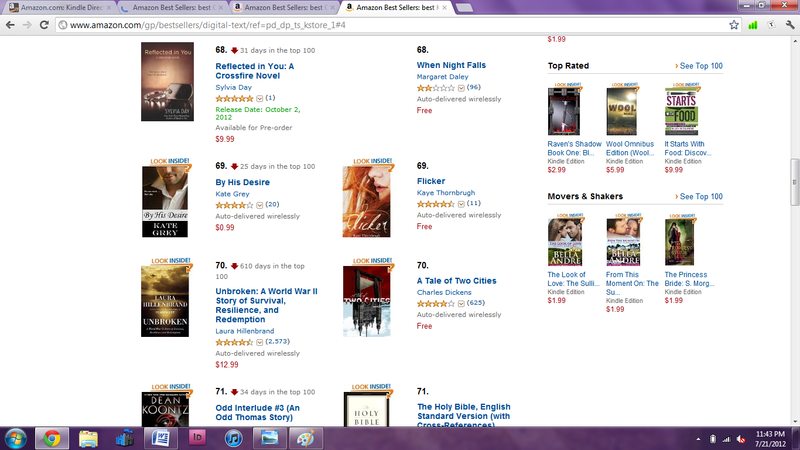 At the end of the giveaway, Flicker peaked at #3 in the romance category, and #69 overall in the free Kindle store! Look! Flicker was downloaded more times than A Tale of Two Cities and the Bible! Now, I never could’ve hit #1 without the help of some exceedingly lovely book bloggers, who promoted the giveaway via their blogs, Twitter and Facebook accounts. Special shout-out to the fabulous folks at The Reading Café, Novel Nerd Bailey, Kindle Fever, The Book Whales, Hey Tara, and everyone else who blogged, Tweeted, Facebooked, or otherwise spread the word about Flicker and made this possible. Thank you so much for your help and support! You guys rock! And to everyone who downloaded Flicker this weekend… THANK YOU!!! I honestly can’t thank you enough. You—yes, you—are beautiful and perfect. Never change! I hope you enjoy Flicker. Feel free to hit me up via blog/email/Twitter/Goodreads/etc. to let me know what you think! Previous Post FREEBIE FRIDAY (and Saturday)! Next Post Bonus Story: "What We Can’t See"
Got it through the site Pixel of Ink. It advertises daily specials on Kindle. LOVED it! Keep up the good work. Jr. High teacher and addicted reader. Thank you! I'm so glad you enjoyed Flicker! Keep an eye out for the sequel, which I'm planning to release this winter. 😀 Also, I hope you'll consider leaving a review on Amazon or Goodreads. I just finished Flicker about 30 seconds ago and I CAN NOT wait for the sequel. Usually there are so many things I would change about a book after I finish reading it but I don't think there is a single thing I would change in this book. Job well done!!!!!! !